chanced and spotted a pair of shoes just the other day. no doubt it was not an uncommon design, but nevertheless, it has been quite awhile since that model has last been seen. 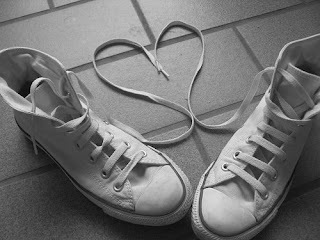 a pair of sneakers that was worn at a particular point of time for a specific purpose, white based with a rim of red at the edges, with pristine white fastidiously crisscrossed shoelaces ending in a neat little bow. a pair that was in sync with another, or hypothetically supposed to. while those pair of sneakers paced to and fro in front of me, a wave of nostalgia hit, with the recollection of memories coming in a flood with each thudded step. an influx of tides of all bittersweet. as the pitterpatter of rain gently hit and disintegrated into the harsh concrete pavement, all that was wanted, was for the rain to wash away the ache that was ebbing dully inside, and to forget all that was. wanting for all to stand still, and stop, as the storm blew and softly crept on its way in. not that it was not worth remembering, rather, it was just heartrending to watch the frenzied play of flashbacks going in a whirl for what was not any longer.